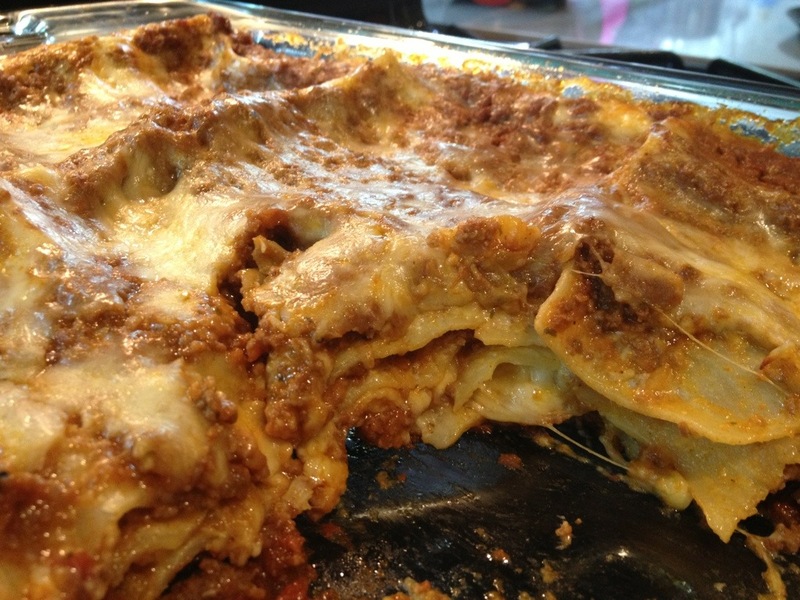 Yummy and satisfying like a big warm hug, this is probably the best and quickest lasagna I’ve ever made. Meat Sauce: Using a large skillet sautee onion and garlic in some olive oil until translucent, but not brown. Add in remaining chopped veggies. You can always use just what’s on hand including zucchini, mushrooms, etc. Cook for about 3-4 minutes. Push the veggies to the outer edge of pan and throw the ground beef in the middle. Using the wooden spoon break up the meat so it can all get cooked and start to brown up. Add in your spices now too so they can cook with the beef. Add enough of your favorite marinara sauce so that you are left with a thick meat sauce (not too runny). Throw in some red pepper flakes for a little kick. At this point I like to puree my meat sauce with an immersion blender stick (do be extremely careful when using this tool or a blender, you need to let the sauce cool down as it may spatter and you could get burned!). I do this because my little ones don’t like the sauce chunky and, to be honest, I am now quite fond of the smooth texture. If you want to make your own sauce I would add a large can of peeled whole tomatoes (I love San Marzano) along with a large can of the same tomatoes but “crushed” variety. This gives you a nice thick sauce and would have to cook for at least 30-45 min and I would probably have added more garlic and herbs at the beginning. Béchamel (White) Sauce: In a large skillet melt the butter with 1-2 TBSP olive oil. When it starts to bubble add the flour and whisk. The trick is to make sure you have enough liquid in the pan so that the flour doesn’t just become a thick ball of dough so be sure to add the flour 1 spoon at a time. Let the flour cook about a minute and then begin adding the warm milk about 1/4 c at a time. Keep whisking and keep the temp high enough so that it is constantly bubbling, and you will see a nice creamy sauce come together. Add salt, pepper and if you like some nutmeg. This sauce thickens as it sits so feel free to make it a little runny. ← Previous Post Let’s get cooking!